Ever watch the news where they have video of a bad guy and you can’t make out what the guy looks like? That’s what happens when poor video quality is used on a security camera. If only they used high definition, the video would actually be useful. A hundred people would recognize the bad guy and he would already be in custody. The author of this article recently fell victim to bad video quality. The accompanying photo to this article shows someone taking off with my patio furniture. 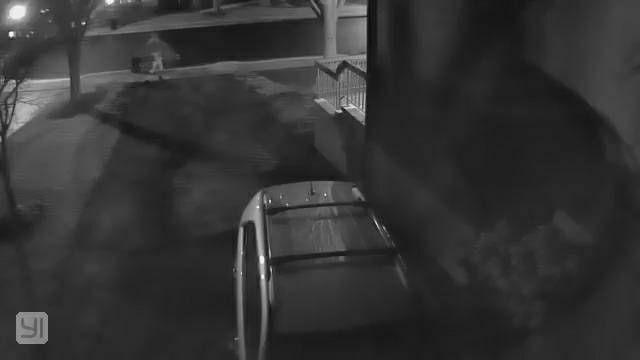 This video, courtesy of my Yi Home Camera at night was using the option that allows the camera to select the video quality based upon internal algorithms that only Yi understands. I wasn’t using high definition and can’t really tell who this is. While I really enjoy the Yi Home Camera as an inexpensive addition, this is a problem. The auto selection of the video quality isn’t something I would recommend using. So let’s take some time to review the video settings, what they get you, and when to use them. This definition varies depending upon convenience and timing. For some, anything that’s 720p is high definition. But for others it’s 1080p. Based upon experience, there is a fairly substantial quality difference between 720p and 1080p. This is especially true at night. The really bad video capture that accompanies this article is neither 720p nor 1080p. The camera that was used actually decreased the video quality to something considerably less than 720p. This quality of video is ok to capture something like a garbage truck crashing into the front tree. Not useful to see a guy walking off with patio furniture. That’s a good question. Video quality and bandwidth requirements go hand in hand. The higher the definition, the more important stable and fast bandwidth becomes. That’s a fairly wide range. You need to have a fairly strong wireless signal to be able to consistently record at 1080p while maintaining a stable connection. While a good router that’s fairly close to the camera can handle this, one that’s a few hundred feet away might not be able to keep up. My mistake was that I allowed the Yi Home Security Camera decide what video quality to select. The funny thing is that it’s connected to a top of the line Netgear Nighthawk AC1900 Dual Band Wi-Fi Gigabit Router. The distance between the router and camera is less than twenty feet with a single indoor wall separating them. If the router isn’t cutting it, add an extender such as the Netgear N600 Wall Plug Version Wi-Fi Range Extender. This extender supports the 2.4 and 5 GHz network. Simply attach the base network cable to the wireless extender instead of the wireless router. I prefer using the 2.4 GHz band for stability across longer distances. What makes Yi think that the lower video quality is the way to go? Beats me. Lesson learned is to experiment with the default video quality. Don’t let the camera select it for you. I can easily run the higher quality 720p video quality without my router even breaking a sweat. While I have since adjusted this setting, it’s after the fact. The camera is now always recording at 720p which is the highest this camera goes to. Yi isn’t the only one to offer this “smart” option of regulating the video quality. The Nest Cam does a similar thing offering an Auto option for video quality. Shut it off and experiment with what works best. For dual bandwidth cameras, use the 2.4 GHz range to maintain a stable connection over longer distances.